We often hear about the ways in which parenthood is a social liability. Have children, and you often lose touch with child-free friends, become impossible to talk to about non-kid topics and miss out on after-hours work functions because happy hour is impossible when there are day care pickups to be done. While there is truth to this, I’ve also found some ways that being a parent can actually benefit one’s social life, both in and out of the workplace. Before I had children, there was something sacred and terrifying about my friends having kids. I didn’t know what to do to celebrate or help them. I think I sometimes sent a card. I also went over and stayed too long while cradling their child and doing nothing else. Then, when I had my first son, I was grateful, but also mortified, when a small army of moms appeared to fortify me with hand-me-downs of all sorts (clothes, furniture, strollers), food, groceries and a sympathetic ear. Now that I have a kid, I pay it forward in the form of food-delivery gift cards, encouraging late-night texts, visits from a paid-for cleaning lady and my own hand-me-downs (which I now realize helps me as much as it helps the new mom in question.) My favorite new-mom move is bringing over food, washing the dishes and then taking out the trash when I leave. Not only have other moms taught me how to treat new moms kindly, I know that I may be teaching other new moms how to do the same when their friends start having kids. My best friend from young adulthood and I had a falling out in our 20s, around the time we both got married. It was a time of high emotions, when we were growing apart and becoming competitive, when it seemed like things like who was the thinnest or who had the largest engagement ring were actually important. We didn’t speak for five years, even though I missed her badly. We reconnected after we each had our first children. Not only did becoming mothers give us something new to discuss, it helped ease some of those old pressure points. No matter how much money you have or how thin you are, you’re gonna have (literal or figurative) poop on your hands. It brings us down to the same level. I’ve always been an outgoing person and haven’t had a lot of trouble making new friends, but I’ve noticed this has gone to the next level now that I have a 4-year-old and a 1-year-old. Mothers of newborns still have a lot of room for high hopes and unreasonable expectations (plenty of “I’m going to do X and I will never do Y”). By the time you have a toddler or a preschooler, you’ve totally abandoned X and probably do Y at least three times a day. There have been certain parents I’ve felt an instant bond with merely due to the fact that our children are the same age, to the point where I’ve gone over to their houses for a first play date and instantly found myself feeding their babies or helping the parents make dinner — just because our lives are, for better or for worse, interchangeable. Parenthood can be the jumper cables for many relationships that wouldn’t have started otherwise. Far be it from me to be one of those moms who tosses her lustrous hair and says, “Parenthood has forced me to consider what’s really important!” I’m writing this at 10:30 p.m. on a weeknight, after all. But by and large, having kids has forced me to put barriers around our/my time. I won’t pretend that our/my time is always a sepia-toned moment of bliss. Frankly, work time is often closer to “me” time than family time is. But by necessity, when the boys come home from school/day care, I have to close the computer, put away my phone and take care of family business. Similarly, on the weekends, I can’t focus on email because I need my energy for these damn boys. Strangely, I think this makes me better professionally than if I just let my work bleed into all my waking hours. I telegraph that my time is important and that I value my brain enough to let it rest at times. 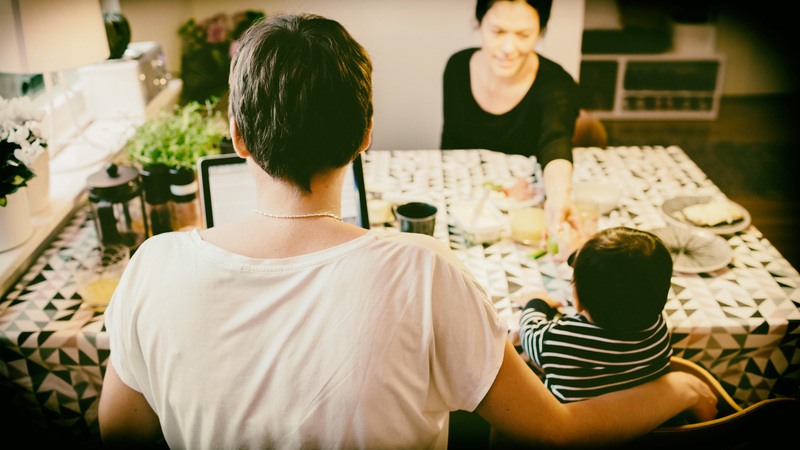 Far from hindering my professional life, motherhood has actually helped. Not long ago, I had a business meeting with a woman I was meeting for the first time, but before we actually got to work, I helped her unload some hand-me-down toys from her car that she was passing on to me. Once you have that personal connection established, it’s easy — practically fun — to talk about adult things like work after that. Meanwhile, becoming a parent has given my writing career a whole new dimension. I write what I know, and while parenting isn’t all I know, figuring out how to do it the best I can and how to manage it all the best I can is an ever-flowing fountain for me. I find it therapeutic to confess my parental shortcomings and to sort out my feelings about motherhood in writing, and I’ve been lucky enough to make a living doing it. Will I continue doing this as my children get older and demand more privacy? Who knows? I can’t guarantee it will happen for all, but for me, undoubtedly, parenthood actually enhanced my creative, professional and social lives.